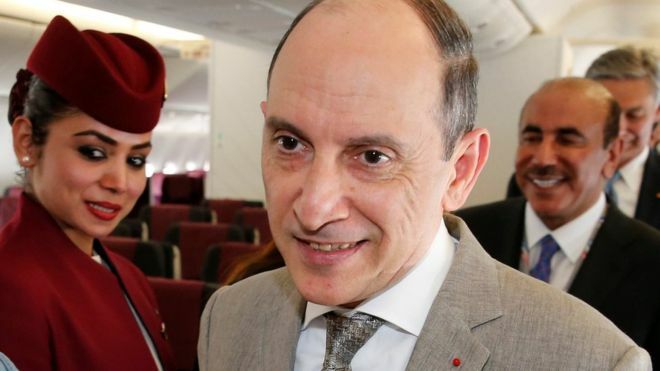 The chief executive of Qatar Airways has apologised for comments he made about flight attendants that were condemned as both sexist and ageist. In a speech at a dinner in Ireland last week, Akbar Al Baker said US airlines were "crap" and their passengers were "always being served by grandmothers". He also boasted that "the average age of my cabin crew is only 26". On Wednesday, Mr Al Baker said the "careless" remarks did not reflect his "true sentiments about cabin crew". "Competition among air carriers is robust. This is healthy, especially for our passengers, but our competition must remain respectful," he wrote in a letter to the Association of Flight Attendants (AFA), a US trade union that has some 50,000 members from 20 airlines. "For the cabin crew serving aboard all air carriers, professionalism, skill and dedication are the qualities that matter. I was wrong to imply that other factors, like age, are relevant," he added. The AFA's president, Sara Nelson, said she accepted the apology. On Monday, after a video of Mr Al Baker's speech was posted online, Ms Nelson accused him of confirming "what AFA has said all along: Qatar Airways thrives on misogyny and discrimination. "Qatar is not only seeking to choke out US aviation, but also the 300,000 good jobs built through opportunity created on the principle of equality." She added: "When there's an emergency on board, a flight attendant's gender, age, weight, height, race or sexuality simply do not matter. What matters is effective safety and security training, along with experience on the job." The vice-president of flight service for American Airlines, Jill Surdek, also said in a message to employees that Mr Al Baker's remarks were "incredibly offensive".